Library Bar LA The Library Bar, L.A. Burgers and classic cocktails amongst classic novels and pretty people in downtown L.A. The Fable The Fable, in London feels like your living room. If your couch was made with books. The NoMad Hotel The Library, in the NoMad Hotel in Manhattan, is a two level library with fully curated volumes that cover everything from the history of New York to the history of classic cocktails. Rittenhouse Hotel The Library Bar at the Rittenhouse Hotel, in Philadelphia. Warwick Hotel The Library Bar, in the Warwick Hotel in Dallas. Classy. Oliver Hotel The Peter Kern Library, in the Oliver Hotel in downtown Knoxville. It’s tiny, but awesome. Battery Park Book Exchange Battery Park Book Exchange, in Asheville, is a legitimate book store, but also a legitimate champagne and cocktail bar. Bourbon and Branch The Library inside Bourbon and Branch is actually a speakeasy complete with its own password and secret entrance. Booze and books just go together. Hemingway, Fitzgerald, Mailer…just about every single author ever—there’s a connection between fine spirits and fine words. And there are a handful of bars that make that connection quite literally, by serving their drinks amidst stacks of the world’s best literature. 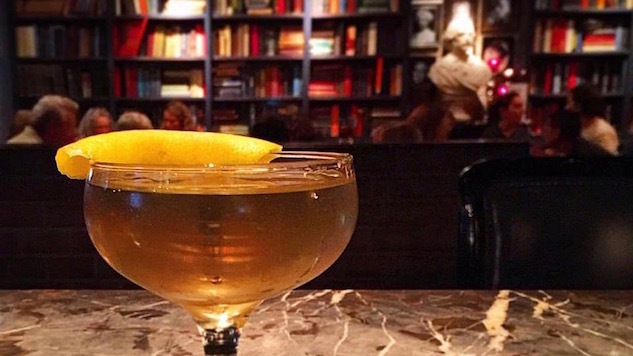 They’re library bars—cozy, often dark and kind of quiet watering holes where you can get a classic cocktail and thumb through a classic novel. Check out the gallery for several of the most picturesque library bars, and imagine yourself drinking Scotch in a place with many leather-bound books that smells of rich mahogany.